Though humans are at the center of the panther’s decline, it is human intervention that can bring this rare big cat back from the brink. Estimated population numbers range from 30 to 150 panthers remaining in the wild. Fortunately, there is an extensive effort underway by government, conservation groups, and caring individuals to learn more about the problems facing panthers and to take action to reverse their declining numbers. The Florida panther is a sleek and muscular cat with a “tawny” coloring on the back and whitish hues underneath, on the neck and lower face. The black accents around the face, tip of the long tail, and back of ears contribute to its appearance of alertness. Florida panthers can be distinguished from other cougars by a crook at the end of their tails and “cowlick” on their back that does not conform to the overall pattern of their fur. This “tail crook and cowlick” are a result of inbreeding due to population decline. The males are approximately seven feet long from nose to tip of tail, stand about two feet tall at the shoulders, and weigh about 100-150 pounds. Females are smaller and lighter, but their color is the same. Panther are strong swimmers and have a keen sense of smell. The young kittens have spots for camouflage that they later outgrow, and their blue eyes turn the same golden color as adults. Female panther reach reproductive maturity at around two years old. Gestation takes three months and there are usually 1-4 kittens in a litter, though it is rare for all to survive. The kittens will stay with their mother until about 18 months old, when they will leave to reproduce and continue the solitary lifestyle typical of adult panther. Their lifespan is ten to fifteen years. You won’t hear a roar from this big cat. Their verbal communication consists of sounds often described as “clicks, purrs, peeps, moans, growls, hisses, whistles, and chirps” and female “caterwauling.” They also communicate using body language with their black-tipped tails, positioning of their ears, and their postural stance. And, a squirt of their “essence” or claw markings on trees also announces their presence to rivals or potential mates. Florida panther live in hardwood hammocks, flatland pine forests, prairies and swamps. They spend the heat of the day resting in Palmetto brush and thickets, and roam at night along corridors, such as streams. They often travel 15-20 miles per day, though they may linger in one area for a week or more, with a territorial range of up to 200 square miles for males and eighty for females. Males rarely overlap ranges and they avoid confrontation. Panther are solitary creatures except when breeding or rearing their young. Panther are shy and avoid contact with humans, preferring the cover of dense brush. 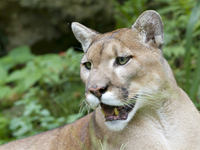 Unlike their western cougar relatives, they do not generally attack livestock. They are strict meat eaters and will make a meal of white tailed deer and feral pigs, sometimes possum, armadillo, reptiles, or raccoons, and even an occasional rabbit or wading bird. Like other big cats, (and small ones too) they stalk their prey, crouching as they inch closer and then lunging as much as 15 feet into action. They can reach speeds of 35 mph, but only for a quick sprint. At times, the wild panther population was as few as 20-30 animals. This caused inbreeding and loss of genetic diversity. Their range is now limited to 5% of the original size, and even that is fractured into pockets of habitat divided by roadways. Habitat loss leads to conflict with cars and other human activity. Installing “wildlife corridor underpasses” beneath highways is an attempt to prevent such collisions. Those panther that reside in forests north of Interstate 75 fare better than those that reside to the south in Everglades National Park’s wetlands, mainly because there are more deer and hogs (large animals) in the north. The smaller possum and raccoons do not provide enough food energy and nutrition and they are loaded with mercury passed along through the food chain. This toxin has been linked to health problems in panther that are forced to rely on these small animals for food. Though legally protected under the Endangered Species Act, an occasional panther will be found dead of gunshot wounds. In December of 2013, an eighteen month old female, nearly breeding age, was found in Big Cypress National Preserve. Even in protected areas, panthers can be harmed by human activities. The loss of genetic diversity has caused some severe genetic defects leading to heart and reproductive problems. When the range of “cougar subspecies” was once much more vast, there was breeding between subspecies that allowed for genetic variety. 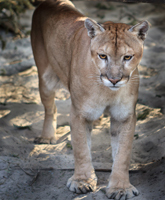 Since the DNA was so similar to the Texas panther, in 1995 eight Texas females were released in south Florida. As a result, the 1995 population of 20-30 grew to an estimated 100 panthers by 2007. The solutions to saving this sub-species from extinction need to be addressed with urgency and must include both the public and private sectors. Some of the obvious solutions, though not always easy to achieve and often controversial, are: expanding their available acreage of habitat; connecting secure wildlife corridors to increase options for mobility; and restoring genetic diversity through captive breeding programs and reintroduction into the wild. Tracking collars are devices that provide an increased understanding of panther habits and allow “trackers” to know if an animal’s movement stops without reason, which might indicate death or a need for rescue. Even in death, the panther can provide valuable information to help us understand more about their needs for a healthy survival. As individuals, we can support programs that focus on panther preservation; let our representatives know that extinction is not an acceptable “cost” of human expansion; take care not to introduce invasive species (the Everglades is experiencing a BOA invasion); if you are a student, learn more and write reports to inform and engage others or become a Wildlife Conservationist as a vocation. There is a saying that goes, “We don’t inherit the Earth from our parents, we borrow it from our children.” Extinction is forever. 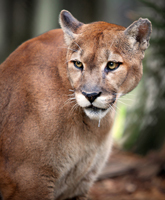 Failure to save the Florida panther from extinction is not an option. Future generations deserve better than that.